When are Dental Crowns Necessary? - Sapphire Dental Centre! A dental crown is a tooth shaped cap which is used to protect the tooth underneath and restore its appearance. The procedure is usually done in two or three separate appointments. In the first appointment, a mold is made of your mouth so that the dental crown can be made to perfectly fit your bit. In the second appointment, your dentist will shave down the tooth being capped and fit it with a temporary crown. Finally the temporary crown will be replaced with a permanent crown which will be matched perfectly to your mouth. To protect a tooth after a root canal. Root canal therapy is an important dental treatment for saving an infected tooth, but sometimes the procedure can leave the tooth brittle and more prone to breakage. To prevent this from happening, your dentist may recommend a dental crown. To replace a large filling. If you have a very large, older filling eventually it can start to fracture. This can weaken the tooth and put it at risk for breaking. When there is more filling than actual tooth, the tooth becomes too weak to chew food. Since it is almost impossible to say when a break will occur, your dentist will likely recommend a crown. Replacing the filling with a crown is a preventative measure that can save you from needing more extensive dental work later on. To improve appearance. Sometimes dental crowns are used for cosmetic reasons. If a tooth is misshapen or discoloured, a crown can improve your smile. There are a wide variety of cosmetic procedures available for this purpose and if your dentist recommends a crown, they will explain why they made that recommendation over other options. To protect badly worn teeth. Teeth can become excessively worn for a number of reasons ranging from an acidic diet to bruxism (teeth grinding). Eventually, the enamel can be worn away which leaves you at greater risk for tooth decay. 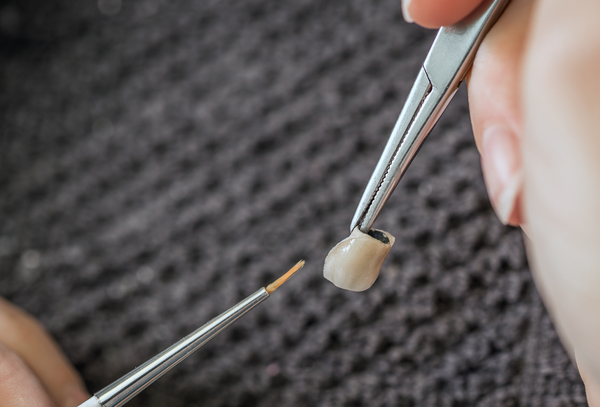 If your dentist has recommended a dental crown it is important to remember that this is a procedure that potentially can save your tooth and protect your overall dental health. If you think you may be in need of a crown or any other dental procedure, feel free to contact Sapphire Dental to make an appointment. Importance of Dental Crowns When Are Dental Crowns Necessary? Why Dental Crowns?